We had are second meet of the season on Tuesday, September 7 at Patroit's Park in Riverveiw and we had even worse luck getting everyone to the meet. Not only was Emily Murphy unable to compete but Angela Krolikowski, Katie Topalian, Terry Monnette, and Parker Turczyn got lost while driving through Detroit. Despitie this, the four freshman girls had very good races and are cutting time quickly. This race serves as a good way to help bulid for the rest of the season and the next four years. 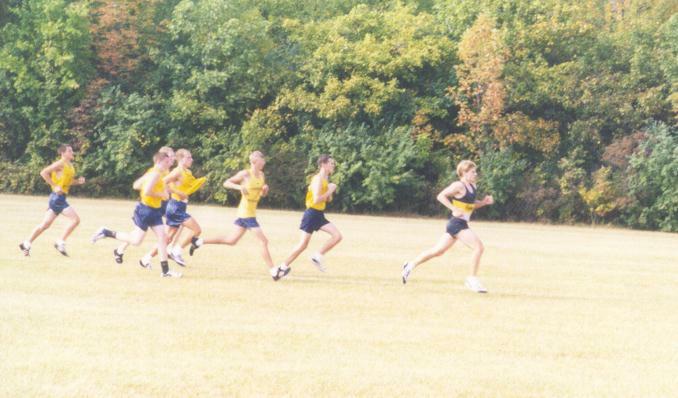 On the boys side only Jeff Maki and Steve Mance raced. Jeff is also taking time off and should be helpful later in the season. Steve took the lead at 50 meters in an attempt to strech the chase pack and never let up, winning by 26 seconds. It wasn't an even paced run but it didn't really matter very much. It wasn't a great meet but it's hard to have one when you're missing half of your team. Next up: The Brother Rice Inv., one of the most competitive meets in the state of Michigan.